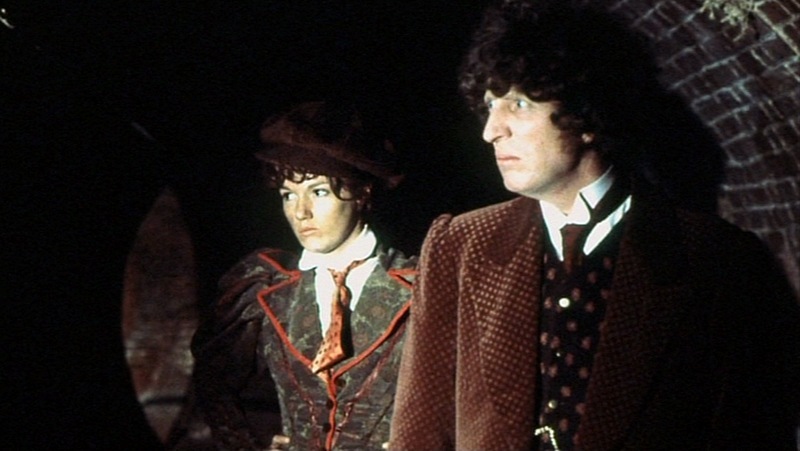 This week we find the Doctor (Baker) and Leela (Louise Jameson) in London in the year 1899. Robert Holmes wrote this six-part fan favourite that originally aired from 26 February to 2 April, 1977. The story features some great and iconic bits, the Chinese Tong of the Black Scorpion, giant sewer rats, a strange stage magician in the form of Li H’sen Chang (John Bennett) a ventriloquist dummy, Mr. Sin (Deep Roy), with a murderous bent and a rash of disappearing women. A murder leads the Time Lord and his companion to work with a Professor Litefoot (Trevor Baxter), and the use of Chang as an interpreter. Unfortunately there is more going on with Chang than anyone at first realizes. It seems, a 51st century warlord named Greel (Michael Spice) is pulling a Phantom of the Opera in the theatre where Chang plies his craft. He is posing as Chinese God, Weng-Chiang, and his power and sway over the local Chinese community s unquestionable. The murderous being is responsible for the deaths of countless women, feeding off their life energy, while hunting for his Time Cabinet (which one assumes is similar to a TARDIS and may allow him to return to his own time). The cabinet has been in the possession of the Litefoot family for sometime, who received it as a gift upon their departure from China. The Doctor discovers that Greel’s time cabinet runs on zygma energy, and this may cause catastrophic problems for both Greel and London! This is revealed physically when Leela unmasks him, and unveils a rather frightening visage. 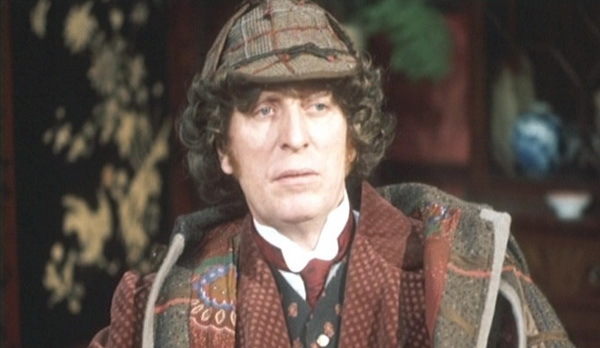 Throughout the course of the story, the Doctor has some fun dialogue, sports a deerstalker, and seems to be having the time of his life wandering Victorian London. Leela is rather unhappy about having to wear so many clothes, and encounters not only the giant rats that Greel has created as guardians, but also is attacked by Mr. Sin. There is also the introduction of a couple of fun characters in Litefoot, and the theatre manager Jago (Christopher Benjamin) – who steal almost every scene they are in, especially Jago who has some of the most enjoyable dialogue in the story. It’s a big, epic sized story, though honestly, I think it could have been squeezed into a four-part tale. I do like the level of production value the story has, it looks better and solid than some of the previous adventures, and as mentioned, everyone looks like they are having a good time. It’s a good, solid tale to end the season on, and it also allows Leela’s character to grow and adapt to the world she is discovering around her through her journeys. I like, very much, that she already is no longer the person who first slipped into the TARDIS a couple of stories ago. Sure, some of her traits must remain the same, but the character is constantly changing, and that’s a good thing… it shows the effect of the Doctor on his companion. Next week, we start season 15 with The Horror of Fang Rock!